Display your screen securely with the Ematic Full-Motion Articulating, Tilt/Swivel, Universal Wall Mount. This device is designed with an adjustable arm that lets you get the best view possible. 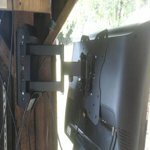 It is made of high-quality aluminum alloy, and it can accommodate monitors that measure up to 55&quot; and weigh up to 88 lbs. This model collapses down to 2.36&quot; from the wall and can be extended up to 15.7&quot;. 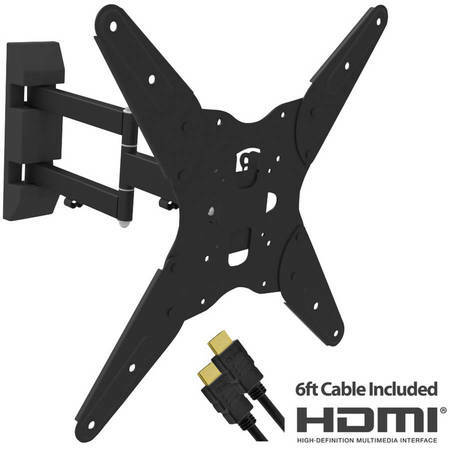 The Ematic full-motion TV wall mount comes with a 6-foot HDMI cable. It also includes a hardware kit with a detailed mounting guide. The two-piece design allows for easy installation and removal. 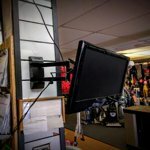 We needed a swivel mount for our presentation Monitor, it needed to be moved to an angle to catch customers attention in our store, Our old mount did not swivel or tilt so this mount looked like a great idea to allow us to demo our products at the checkout counter area. Our monitor is a 21 inch Viore. To mount the swivel wall unit was relatively easy, this took our IT guy about 20 to 30 minutes to install and the kit had more than enough nuts & bolts to do the job. We mounted it onto the Slate wall next to the counter and with all of our Customers being able to view it from where they stand. 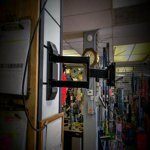 The angle is a perfect fit for tall or small customers to see, and because we try and do a presentation video and the counter while customers are waiting this will be a good lead in to customers asking questions about other products & services that we offer. My recommendation of this mount is Positive and I like the way it allow us to move it into position to view and then move it out of the way for us to walk around next to it. It is a great value and compared to other mounts it runs about ½ to price. I would definitely rate it highly for it's use. The Ematic Full Motion Articulating Tilt/Swivel Universal wall mount was a perfect addition to our living room. This wall mount will fit a flat screen television from 17 to 55 inches. I am very happy with the finished product. It changes the look of the entire room. It looks beautiful and makes the living room seem so much larger since we no longer need to have a large entertainment center to hold our big screen television set, the cable box, and the DVD player. My son in law helped me to install the wall mount. It would normally take one person strong enough to hold the flat screen TV to do the job but I'm not that strong so I acted as his assistant. He was very impressed with the quality of this product as was I. 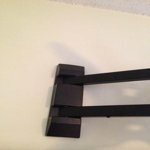 The wall mount comes with easy to read instructions and the install took less than 30 minutes from start to finish. It also includes a 6 foot HDMI cable which was an added bonus. The wall mount has a shinny black metal finish that is strong and secure. 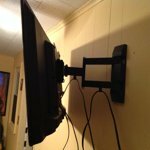 I am very pleased with the fact that the flat screen wall mount can be adjusted to whatever angle is most comfortable for viewing the television from any seat in the living room. I would highly recommend the Ematic Full Motion Articulating Tilt/Swivel Universal wall mount to anyone in the market for a wall mount. You will be pleased with your purchase and the finished product. Ematic Full Motion Articulaing Wall Mount 17"-55"
The Ematic Full Motion Articulating Tilt/Swivel Universal Wall Mount for 17"-55" TVs with 6' HDMI Cable is the best TV mount I've seen yet. All of the metal parts are well made, heavy duty, fit well and have a black painted finish. This mount articulates all directions to give the user the perfect viewing angle. This kit is all inclusive and has sets of all of the different size screws you may need to attach your TV to the mount. Four heavy metal extension plates are included if the user has a 32" - 55" TV. Spacers washers, screws and even a small level is included in this kit. Also four lag screws and even an HDMI cable are included. There is only one small plastic part which is the finish trim plate that covers the four lag screws to the wall. *Note: The finish plate is pulled back for clarity. This is a great addition to our back yard gazebo. I am a non mechanical female so I had to have help putting this up. I read the instructions to the person putting it up because of course HE wouldn't... Ummm anyway. The directions were very easy to follow. We used the stud finder to find the studs as directed, had to borrow one so if you don't have one I would strongly suggest you borrow one. It was easy mounting the brace to the tv. I would also recommend two people to mount the tv to the base on the wall. Strongly suggest if you are putting in drywall to use those special drywall screws or the inserts. 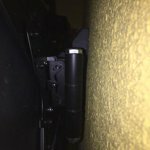 The mount may be able to hold that much weight but make sure the screws and the wall can! I love the fact that you can tilt the tv to any angle. This is mounted in the room right in front of my treadmill. So it can be tilted to be able to watch without the glare when on the treadmill. It will also turn right or left if you are in a different part of the room. It seems very sturdy and secure to the wall. I have mounted it over a dresser and the space saving is great. I found this to be well built out of heavy steel supports. I used it for a small kitchen size LCD TV. I was pleasantly surprised it included an HDMI cable and even a small level to do a professional installation. The Instruction sheet is a little sketchy for the alignment hole pattern but trial and error I figured it out. 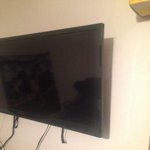 I have and older 42 inch plasma Panasonic which didn't have any holes for which this mount would work or any mount for that matter. So I might be wise to check out the back side of your TV to make sure it can be mounted on a wall. This ematic full motion articulating tilt/swivel wall mount is incredibly sturdy and fairly easy to install. It arrived in a small package that came with a small level and an HDMI cable as well as brackets to add to the unit for larger TV's. The wall mount assembles in two parts. First you attach it to the wall using three large screws. 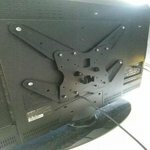 Then you attach brackets to the back of your TV. You the have to remove the plate from the wall mount and attach it to the back of the TV. Then you put the plate back onto the wall mount (it hooks to hold it in place while you screw it together). Overall, installation wasn't that bad. It took my husband and I about forty-five minutes from start to finish and that included removing the base from our 32" TV. The one thing you need to be very certain of when you attach the wall mount to the wall is that it's perfectly level. Any variation results in a tilted TV and it would mean removing it and resetting the screws to fix this. It's awkward to both hold it up and mount it, so have an extra pair of hands nearby. Once everything is attached to the wall, you can enjoy your TV. The tilt and swivel are very stiff and require two hands to move it around. This is good in a way because it will hold its position. But I was a little nervous at how much pressure I had to put on the TV to get it to move. It has quite a large range, though I believe the range would be decreased the larger the TV. The TV we installed on it is a 32" model. I have absolutely no worries that this unit is going to come loose or drop my TV, and it's nice because if we decide to upgrade to a larger TV model, this mount will accommodate up to a 55" TV. It's also nice because it doesn't take up a lot of space. You can't even tell it's there when the TV is on it. It gives it the appearance of floating. 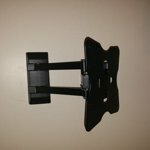 In the end, if you are looking for a compact wall mount that will hold your TV sturdily in place, this is definitely a mount to consider. The bonus HDMI cable makes it really worth it. And, you'll get a free level to keep in your toolbox, too! This wall mount definitely does the job! The Ematic Full Motion Articulating Tilt/Swivel Universal Wall Mount for 17"-55" TVs was easy to install. It didn't take much time at all to put up. It is small and compacted. It doesn't take up much space on the wall at all, which is a good thing. I put it up in the Sunroom/Computer room to hold up a thirty-two inch television. I recently purchased one from Walmart for over one hundred sixty five dollars for the basement television. Well, if I knew about this one, I would have waited, because this one would have done the job just as well as the one hundred sixty five dollar one. And it is much much cheaper! It looks really good and the color will match any room decor. It is strong and sturdy for a small mount. I love the fact that it swivels from left to right and up and down. I can now enjoy watching television in my sunroom. I would definitely recommend this wall mount because it does the same job an expensive one will do. I got this product because I have a tv that needs to point in two different directions. I have an oddly shaped room where we watch tv in one direction but need to point the other way to play the Wii so we have room to move. This tv mount has a full swing to the left and right. It also goes up and down and then tilts up and down so you can really point it in any direction! It feels really rugged right out of the box so I wasn't afraid my tv would fall off when I put it on. On the box it shows on X shaped mount but it is really a square ( see pic below). It comes with hardware including a little level! 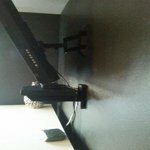 Works great but as a novice at installing wall mounts it was a bit tricky for me. To complete this project you will definitely need a power drill, a stud finder and 2 people for a larger television. The instructions were pretty good except for 2 mislabeled screw sets, the correct ones were there they were just switched (no big deal). 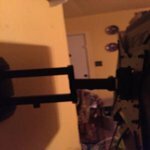 The problem I had was mounting the holder to the tv this was so difficult for me this was my first time putting a wall mount together and it was like figuring out a puzzle trying to make it all fit. I had it wrong so many times, even upside down. 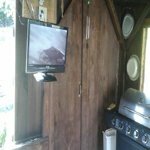 Due to the placement of my tv mount holes my mounting job did not look like the picture, but the great part was you can customize it to fit any tv. They even give you multiple sets of screws to fit whatever kind of tv you have. This wall mount even came with a small set of tools to perfect your job, like the mini leveler was a bonus. The tool set addition makes this product even a better bargain. The level of difficulty was high, but I am a novice. This project took me 2 hours start to finish, I don't think it will take the average person as long as me. The swivel feature is great but I had to oil and loosen the joints before mounting everything because it was really stiff. Mounting my tv has given me my dresser space back in room and it looks great. It is even tilted down a bit so my television looks bigger and brighter, love this. Was able to even set it up myself. To start off the instruction manual could be improved 100%. It is 4 pages of pictures. The hardware (screws etc) was nicely packaged for ease of understanding what went where. That is where the easy part stops. My wall mount was so tightly screwed together I could hardly get it to move with me just trying to articulate it with my hands. I had to loosen some of the tension on certain joints to get it to come all the way open. It still is very stiff but for obvious reasons I left it that way when I put it up on the wall. It still takes a bit of "making it go" to open it all the way but you sure don't want it so loose it moves from its own weight. They also give you a small level so you can be sure your line is straight when you screw in the mount. That was a nice touch but like I said before all the hardware was nice it was in the instructions that were lacking but common sense makes up for what is lacking in directions. So I found the stud where I wanted it on the wall. Made my line so I would put it up straight (again checking with the small level included in package). So now all that was done and was fairly easy to accomplish it was time to put the face plate on the TV itself. This Plate will fit almost any Vesa standard that your TV is. Mine is a 200x200 but a 400x400 would be just fine also. Once I got the face plate (as I call it) on I thought to myself can I put this TV up there and hang it myself?? Well I figured I would give it a shot. My TV weighs around 40 lbs I am guessing so not too heavy but also not too lightweight. It is just a 32" Vizio but it's a older model so a bit more cumbersome than the newer TV's. Anyway I tried it and got it on fairly easy. I had the arm extended out just a bit so I would be able to tighten the screw once I had it up there. I forgot to time myself but I would say with me being extra cautionary (I mean I am hanging my TV on the wall) it took me about 90 minutes all told from taking everything out of the box and looking at poor instructions several times to make sure I was on the right path. I did not need a new HDMI cable but it's always nice to have one on hand in case one goes bad. I has been up a few weeks now and no problems. I really do enjoy the TV sitting at that height and it's very nice to be able to turn the TV right or left depending on where you are sitting in the room.